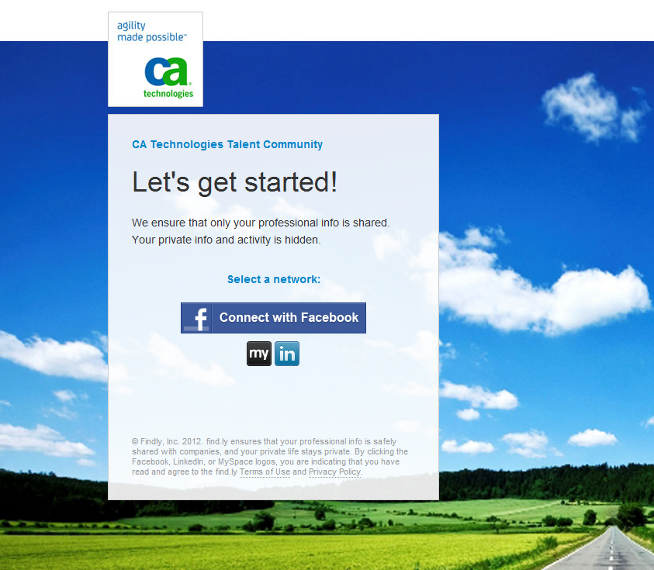 We noted your interest in CA Technologies career opportunities and that you’ve previously applied to our Careers site, and wanted to invite you to join our talent community. 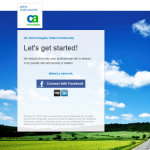 By allowing us to follow your career through one of your preferred social networks, we’ll be able to reach out whenever we’ve identified the best opportunity for you here at CA Technologies. Please take a moment to join our community. It’s fast, easy, and most importantly – secure. Unlike other social media based “groups”, no information will appear on your profile and you can control your information easily, at any time. 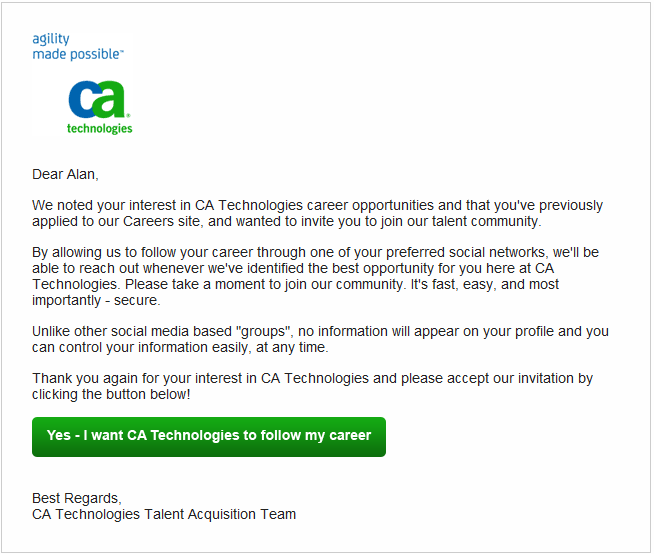 Thank you again for your interest in CA Technologies and please accept our invitation by clicking the button below! The second picture is the landing page if you click through from the email. No, I didn’t sign up, but notice the MySpace connection. It’s amusing that not only, as Larry Ellison famously quipped, is CA where “software goes to die,” but apparently its also where social networks go to die? However, there is a more important trend here. This is an interesting take on social monitoring. 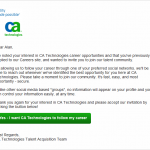 It appears that CA wants to track and monitor my “career.” Isn’t the real value in recruiting in finding the best person for the job, not the best person who applied for the job? How will this impact the recruiting process? In a world of pervasive communications, is this a disruption of the standard recruitment ecosystem? Do I really want companies keeping track of my career? If you’ve had experience with this — on the vendor side or the candidate side — I’d really like to hear from you. Next What Do I Do With All This Stuff? alright, you rec’d yours a year ago and I rec’d mine today. I don’t like at all how they portray themselves – in my email, anyway – as being a part of the actual company that I’ve applied to. There definitely is something a bit nefarious going on, they’re pretty much just collecting everyone’s info who is unemployed – which is tons of people these days – to help build their database and increase their “brand”. What ACTUAL service they provide is dubious and questionable at best. “It’s Mary from Sears, with a new service to help you get a job. Clearly no one will “talk to” me anytime soon. It’s nothing more than SPAM, where they’re trying to get you to join their ‘club’.